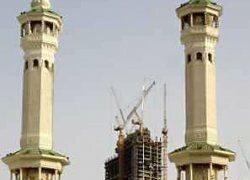 MECCA, Saudi Arabia (Reuters) - Some of Islam's historic sites in Mecca, possibly including a home of the Prophet Mohammad, are under threat from Saudi real estate developers and Wahhabi Muslims who view them as promoting idolatry. Sami Angawi, an expert on the region's Islamic architecture, said 1,400-year-old buildings from the early Islamic period risk being demolished to make way for high rise towers for Muslims flocking to perform the annual pilgrimage to Islam's holiest city. "We are witnessing now the last few moments of the history of Mecca," Angawi told Reuters. "Its layers of history are being bulldozed for a parking lot," he added. Angawi estimated that over the past 50 years at least 300 historical buildings had been leveled in Mecca and Medina, another Muslim holy city containing the prophet's tomb. Wahhabism, Saudi Arabia's dominant doctrine which promotes a strict narrow interpretation of Islam, was largely to blame, he said. "They (Wahhabis) have not allowed preservation of old buildings, especially those related to the prophet. They fear other Muslims will come to see these buildings as blessed and this could lead to polytheism and idolatry." The Washington-based Saudi Institute, an independent news gathering group, says most Islamic landmarks have been destroyed since Saudi Arabia was founded in 1932. It cited a 1994 edict by the kingdom's senior council of religious scholars which ruled that preserving historical buildings might lead to polytheism. Angawi, who founded the Haj Research Center in 1975 to study and preserve Mecca and Medina's rich history, claims to have identified a home of the Prophet Mohammad. But he is reluctant to publicize its location fearing it would be demolished like DAR al Arqam -- the first school in Islam where the prophet taught. Angawi's views were echoed elsewhere. In London, Geoffrey King, Islamic art and archeology specialist at the School of Oriental and African and Studies, said the fate of Islamic historic sites in Saudi Arabia was "depressing." "The religious authorities have failed to appreciate the significance of these buildings to Muslims and scholars worldwide," said King, who taught for several years in the kingdom and stressed many young Saudis agreed with him. Followers of Wahhabism say Muslims should focus on Mecca's Grand Mosque, which contains the Kaaba -- an ancient structure that more than 4 million Muslims visit each year as part of haj and umra pilgrimages. Real estate firms see massive demand for new accommodation to house up to 20 million pilgrims expected to visit Islam's holiest city annually over the coming years as authorities relax entry restrictions for pilgrims. "The infrastructure at the moment cannot cope. New hotels, apartments and services are badly needed," the director of a leading real estate company said, estimating that developers are spending around 50 billion riyals ($13 billion) on projects in the city. Dominating these is the 10 billion riyal Jabal Omar scheme. Covering a 230,000 square yard area adjacent to the Grand Mosque, the seven-year project consists of several towers containing hotels, apartments, shops and restaurants. Angawi said these developments will dwarf Mecca's Grand Mosque and are a sign of crass commercialization. "Mecca is being treated like a bad copy of any city when it is a sanctuary. The house of God is being commercialized and these developments are disrespectful and totally out of proportion." But the Jabal Omar Development Company, the firm behind the project, said it was changing Mecca for the better, not least in demolishing more than 1,000 poorly built homes that clung precariously to the hillsides around the Grand Mosque. The firm said around 70,000 residents from 29 different nationalities used to live on the Jabal Omar site before selling up and moving into better quality housing elsewhere. The residents of a similar neighborhood close by seemed to be equally eager to attract developers. Ali Hussein, a 38-year-old originally from Myanmar, lives in a cramped house deep within a network of unpaved, rubbish-strewn alleyways. "The people that moved away now live in nice homes," he said as a stray cat skipped over a puddle of sewage nearby. "This is a very poor area. We hope another investor will come," said Amin Rafie, a local community ombudsman, adding that residents would likely be offered a handsome price for their disheveled homes in Saudi Arabia's oil-driven real estate boom. But Angawi wasn't convinced of the developers' motives. "We have to accommodate these new pilgrims, but do we have to do it in towers and skyscrapers? Making money seems to be the bottom line here," he said.